Forest people have managed their land sustainably for hundreds and sometimes thousands of years. They have, as a result, contributed the least to climate change, but they may suffer the most from its consequences. If that happens, their suffering will become our suffering as forests degrade and disappear, releasing billions of tons of carbon dioxide into the atmosphere. That’s why environmental NGOs advocate for “Reducing Emissions from Deforestation and Degradation. Thanks to their efforts, companies, governments, and individuals have voluntarily invested billions in climate action over the last quarter century, and now governments around the world have pledged more than $7 billion to REDD through the end of this year. These seven articles from Ecosystem Marketplace offer an accessible introduction to avoided deforestation actions and how they’re financed and especially how it relates to indigenous people. REDD Dawn: The Birth of Forest Carbon looks back at the world’s first REDD project, which was conceived in 1988 by the World Resources Institute. It offers a brief introduction to the science of carbon accounting and an overview of REDD within the climate talks. Indigenous People Explore Many Shades of REDD looks at how REDD has evolved on indigenous territories to-date, and how indigenous leaders believe it must change to truly deliver on its potential. 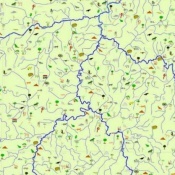 Choc-Darin: What Projects Can and Cannot Achieve offers a deep dive into a project developed by the Afro-Colombian Tolo River People and a primer on how REDD plays out on the ground. Indigenous Life Plans and Carbon Finance: Two Sides of the Same Coin? examines the symbiotic relationship between indigenous “Life Plans and REDD. The Surui Forest Carbon Project: Lifeline For A Life Plan offers a detailed glimpse inside a pioneering indigenous project built on an indigenous Life Plan. Initially posted in 2013, it’s a bit dated, but still a good read. Jurisdictional REDD: Long Deferred, Soon Delivered examines the state of “jurisdictional REDD programs government-to-government programs that are designed to reduce deforestation across an entire state or country. Avoiding Deforestation And Green Supply Chains: The Yin And Yang Of Saving Forests examines role that REDD finance can play in helping to purge deforestation from corporate supply-chains. Governments around the world will have pledged more than $7 billion to support "REDD", which is an acronym for "Reduced Emissions from Deforestation and Degradation" of forests. The acronym covers a broad set of activities that aim to slow climate change by saving endangered forests and keeping carbon locked in trees. In this series, we examine the history of REDD and the evolving role of indigenous people. 3 June 2015 | By all accounts, REDD was born in 1988 – not so much to save the planet as to help poor farmers in Guatemala manage their land more sustainably. It’s germination, however, began three decades earlier, in 1958, at the Mauna Loa Observatory in Hawaii. 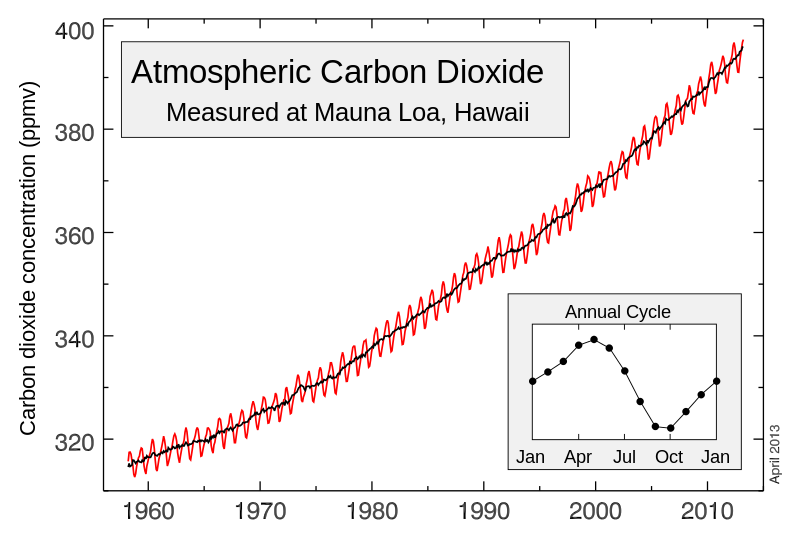 That’s where the late American scientist Charles Keeling started measuring the amount of carbon dioxide in the atmosphere – an exercise that eventually yielded the “Keeling Curve”: a diagonal line that zigzags upwards as CO2 levels increase year-to-year. 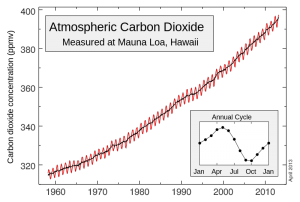 The Keeling Curve: This is your planet on CO2. Source: Global Warming Art Project. The upward slant continues to this day, while the zigzags reflect the rhythm of farms and forests in the Northern Hemisphere coming alive in summer, when they sponge up CO2, and falling dormant in the winter. If this natural rythm had such a pronounced effect on the atmosphere, scientists began to wonder, what impact does rampant deforestation have? How much of our greenhouse gasses come from industrial emissions, and how much form chopping trees? By the early 1970s, scientists were beginning to see climate change as a very real but distant threat – one that would eventually force us to completely restructure our industrial economy. Physicist Freeman Dyson was one of those who decided to get ahead of the challenge by looking for workable solutions. Meanwhile, in 1974, humanitarian organization CARE had launched a program called Mi Cuenca (My Watershed) to help Guatemalan farmers save their topsoil – in part by planting rows of trees on steep farmland to capture runoff and create natural terraces. The project soon became an unqualified success, and farmers across the region were clamoring to join, but by 1988 CARE was running out of money, and the project was on its last leg. That same year, the United Nations launched the Intergovernmental Panel on Climate Change (IPCC) to explore the science of global warming, while an energy executive named Roger Sant started looking to expand his company’s output – preferably by building wind farms. A proponent of green energy in the Carter Administration, Sant had co-founded a company called Applied Energy Services (AES), in part with the objective of making green energy work. Wind-farm technology, however, wasn’t what it is today, so Sant asked the World Resources Institute (WRI) if there was a way to offset his emissions by reducing them somewhere else – a radical concept at the time. WRI picked up Dyson’s idea – which other scientists had since moved forward – and suggested he plant trees across the United States. That quest found its way to Paul Faeth, an agricultural engineer with the International Institute for Environment and Development (IIED), which was in the process of merging into WRI. Faeth knew of Mi Cuenca’s plight, and he proposed killing two birds with one stone: by planting trees in Guatemala, he said, AES could help both the environment and the rural poor. Intrigued, AES began working with WRI to explore the science of carbon accounting – science that had, ironically, been perfected by timber companies to estimate the amount of wood in a forest. It was a simple but labor-intensive process that involved measuring trees at chest-height and then applying “allometric equations” based on the trees’ species and circumference to see how much wood they contained. From there, it was simple math to extrapolate the amount of carbon: basically, divide the wood by two. But there was more to it than just the carbon in the newly-planted trees. Researchers at the time were estimating that deforestation contributed about 20% of global greenhouse gas emissions – estimates that have since been confirmed by the IPCC. That meant you could reduce greenhouse gas emissions faster by saving endangered forests than by planting new trees, which would need decades to get big enough to matter. Plus, living forests provide habitat for endangered species and deliver “ecosystem services” such as water filtration and climate control. On top of that, saving forests seemed inexpensive. In the end, AES decided to spend $2 million to save and expand Mi Cuenca to offset 2 million tons of its own internal CO2 emissions. CARE re-named the project “Mi Bosque” (My Forest), and today their experiment is considered by some to be the world’s first REDD project. Although a later analysis found it drastically over-estimated the amount of carbon that was kept out of the atmosphere, it sparked the decade of experimentation that led to the creation of today’s rigorous carbon standards. The project caught the eye of The Nature Conservancy, and pilot projects started proliferating across Latin America. The term “REDD” wouldn’t enter the vernacular for another 15 years, but NGOs began developing structured, methodological approaches to “Avoided Deforestation” (AD), which became a hot topic at the Rio Earth Summit in 1992, as well as at the First Conference of the Parties (COP 1) to the United Nations Framework Convention on Climate Change (UNFCCC) in Berlin in 1995. As climate talks progressed, analysts like Trexler and ecologists like Tia Nelson of The Nature Conservancy argued for the inclusion of REDD in the UNFCCC framework as a critical means of immediately dampening the rise in greenhouse gases. On the REDD front, proposals ranged from “project-based” frameworks like Mi Bosque to “national baseline frameworks” using a country’s historic rate of deforestation as a performance baseline and then offering payments for beating it. The proposals, unfortunately, found little traction – for a variety of reasons. To begin with, few climate negotiators had a forestry background, so the science was lost on them. Furthermore, “offsetting” had become equated with “incentivizing industrial reductions”, and most environmental organizations were horrified by the idea of cheap offsets, which they feared would flood the market and remove the incentive to change industrial practices. Finally, developing countries – still mindful of their recent colonial past – feared that REDD would cost them control of their forests. On top of all that, no one really agreed on how best to determine which forest was in danger and which was not. As a result, when the Kyoto Protocol emerged from COP 3 in Kyoto, Japan in 1997, REDD was off the UN table and relegated to voluntary markets, where it continued to evolve at the pilot scale under real-world conditions. Over the next 15 years, standard-setting bodies like the Verified Carbon Standard and the American Carbon Registry emerged to provide ways of determining which forest was endangered and which procedures can be used to save it. At the same time, the Climate, Community & Biodiversity Alliance emerged to ensure indigenous rights, and forest communities that embraced REDD found themselves able to earn income from their stewardship of the land. Then, at the 2013 climate talks in Warsaw, the UNFCCC finally agreed on a REDD Rulebookfor jurisdictional REDD. Technically, it’s not a book, but a collection of seven decisions that provide guidance on how countries can harvest available data to earn REDD income. The Rulebook’s provisions for program development are significantly less rigorous than the standards imposed on voluntary projects, but the payments into jurisdictional programs aren’t offsets – meaning countries can’t claim to have reduced their own carbon footprint. Instead, jurisdictional programs are increasingly seen as “payments for performance” that could slow deforestation by supporting sustainable agriculture – while at the same time creating a framework within which more rigorous individual projects can address specific local challenges.